At the time when Lithuania was under Russian rule, national identity was shaped by the Lithuanian intelligentsia, the educated social elite in the country. One of the most prominent intellectuals and activists of the late 19th century was Vincas Kudirka, a publicist and publisher, author of Lithuania’s national anthem, and one of the Founding Fathers of the modern Lithuanian nation. Kudirka was born on December 31, 1858 into a well-to-do farming family in Paežeriai, in the county of Vilkaviškis. He attended Marijampolė High School between 1871 and 1876, showing both musical and literary talent. Although Kudirka attended Lithuanian language classes at school, like many people of the time, he preferred to speak Polish. He was fond of Polish literature, especially the works of Adomas Mickevičius, and following the writer’s example, began to consider himself gente lituanus, natione polonus – Lithuanian by birth, Polish by nationality. At his father’s insistence, after completing six years of secondary studies, Kudirka entered the Theological Seminary in Seinai. However, he showed no desire to stay there, and after two years he was terminated due to “lack of vocation.” He returned to Marijampolė in 1879, where he began to write poetry and humorous and satirical articles. In 1881, Kudirka entered the prestigious University of Warsaw, studied philology for a year, then decided to study medicine. While there, he was arrested by the Russian authorities for preparing a translated copy Karl Marx’s famous Das Kapital for duplication. But his extended interest wasn’t in Marxism. It was while he was in Warsaw that Kudirka became aware of the difference between Lithuanians who adopted Polish culture and native Poles, and the distinctiveness of each national identity. In addition, old colleagues from Marijampolė, the fervent Lithuanian nationalists Jonas Jablonskis and Jonas Basanavičius, added to his awakening. In 1883, in a letter from Moscow where he was studying at the time, Jablonskis reproached Kudirka for being polonized and abandoning his native language. 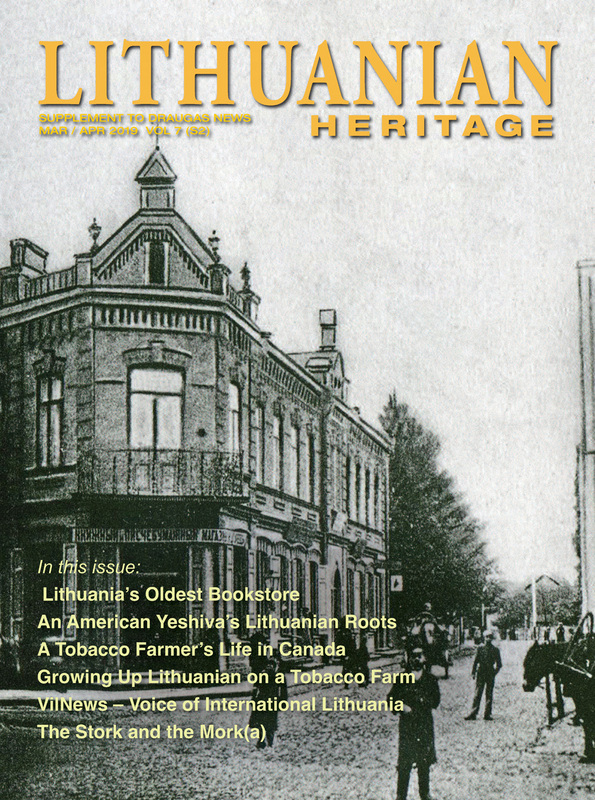 Jablonskis also wrote longingly of their homeland and of his desire to work for the welfare of Lithuania and its people. 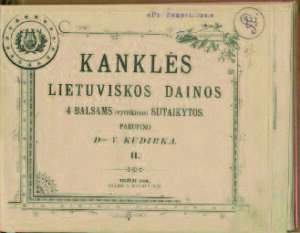 And he made a crucial recommendation: Jablonskis suggested that Kudirka might consider subscribing to the Lithuanian newspaper Aušra (The Dawn), published by Jonas Basanavičius. Members of the ‟Varpininkai” (proponents of Varpas and its ideas). 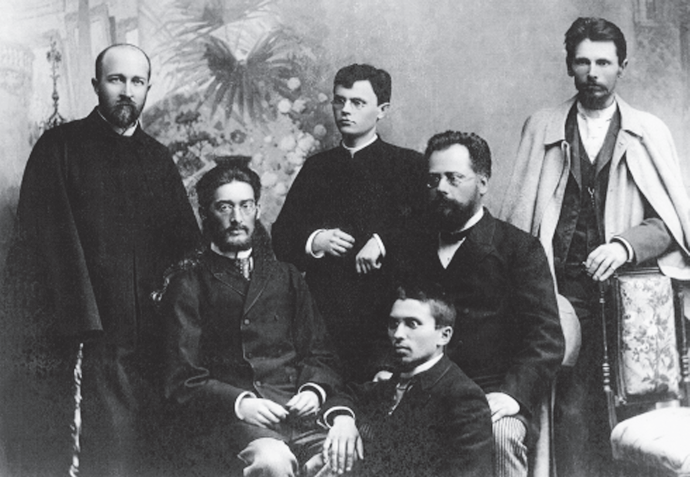 Standing from left to right: Jonas Jablonskis, Juozas Tumas, Vincas Kudirka; seated: Motiejus Lozoraitis, Motiejus Čepas and Gabrielius Landsbergis-Žemkalnis. Having found his identity, Kudirka did not waste any time and in 1885 joined the ranks of contributors writing for Aušra. In 1888, during his final year of studies, Kudirka and twenty-one other Lithuanian students founded a secret (and illegal) society in Warsaw called Lietuva. Its main purpose was to rekindle the national spirit, spread enlightenment by publishing books and newspapers, and instill a sense of Lithuanian identity. 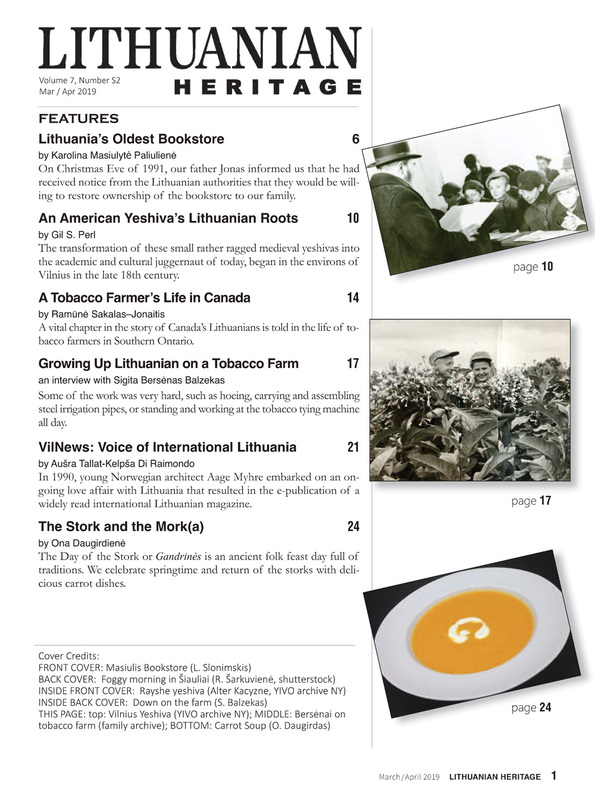 One year later, the group began to publish the Lithuanian newspaper Varpas (The Bell), with Kudirka as its first editor. 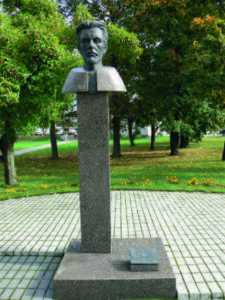 It became an important means of propagating ideas of national identity and promoting patriotism not only to the elites, but as Kudirka wrote in a letter to Jonas Basanavičius, to Lithuanians of average education. Varpas would play a major role in the Lithuanian national revival during those turbulent times. Despite the fact that the print run of Varpas was not more than 1,500 copies, it was widely (albeit, secretly) circulated and read. Kudirka wanted the newspaper to be tolerant in religious matters, seeking to unite all Lithuanians, regardless of their individual religious beliefs. He was aware that raising national consciousness of the Lithuanian peasantry was impossible without the improvement of their economic conditions. Thus, in the following years, Varpas began to publish increasingly controversial articles regarding various social and economic issues. And it insisted that the Lithuanian language have equal rights with the Polish and Russian languages in the country. Unfortunately, Kudirka’s work in the Lithuanian political and national movements lasted for only ten years. When Varpas started publication, it became clear that Kudirka was suffering from tuberculosis (his mother died of tuberculosis; his brother and his two sisters also suffered with this infectious disease). Nevertheless, he completed his studies, received his medical degree and began to work as a doctor in Šakiai, a town not far from his birthplace and close to the Lithuanian-Prussian border. A monument to V. Kudirka in Šakiai, the town where he worked as a physician. His life in Šakiai was one of activism coupled with hardship and privation. 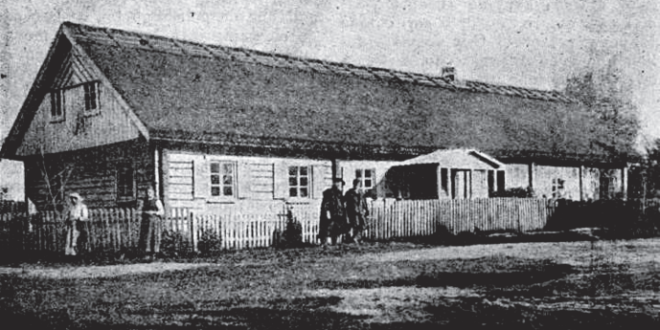 Unable to find a suitable apartment, Kudirka was granted temporary shelter in the local parish. The parish’s humble storehouse, unheated and poorly lighted, served as his doctor’s office for receiving patients. Making sick calls on foggy, cold and rainy days, and traversing muddy roads added to the difficulties of his living conditions and his worsening health. Vincas Kudirka was the first physician in the region to attend his patients using the vernacular Lithuanian language. For an educated gentleman to speak Lithuanian rather than Polish was still a rarity and made a big impression on the people. He worked as a physician in Šakiai from 1890 to 1894, even as it was becoming increasingly obvious that he was a very sick man. The symptoms of tuberculosis were undeniable: weight loss, fever and chronic cough with bloody sputum. Upon the urging of his closest friends, at the end of 1894 he left for Yalta on the Crimean peninsula, desperately seeking a cure. However, due to lack of funds, he was soon forced to return to Lithuania. He found a place to live in Naumiestis, (renamed Kudirkos Naumiestis in 1934), a sleepy little border town. There, he forsook the practice of medicine to focus on journalism, literature and patriotic activities. Kudirka was arrested by the Russian authorities on suspicion of writing for Varpas, but fortunately, was released due to insufficient evidence. As his health continued to get worse, Vincas Kudirka left to spend a few weeks at a resort on the Adriatic Sea. He returned to Naumiestis in the spring of 1898, in an advanced state of illness. In 1899, the last year of his life, Kudirka moved into the small wooden house of the recently deceased Reverend Čarneckis. The house was only a few hundred paces from the bridge connecting Naumiestis with its twin city of Širvinta on the other side of the Lithuanian-Prussian border. Russia’s prohibition of written and printed Lithuanian language was still in full effect, and the location of his home was significant. The Širvinta post office came to serve as a secret drop-off point for Kudirka’s letters and manuscripts designated for publication in the banned Varpas. Jonas Staugaitis, future president of the Lithuanian parliament, wrote in his memoirs: “Whenever I happened to visit Vincas Kudirka, I was always impressed by his appearance: in a small room on a bed, lay a lean man, almost like a shadow, with an immense strong will and burning eyes, always writing and writing.” Despite being desperately ill, Kudirka was steadfast in his purpose and resolve, writing constantly to the very end of his industrious life, which came on November 16, 1899. 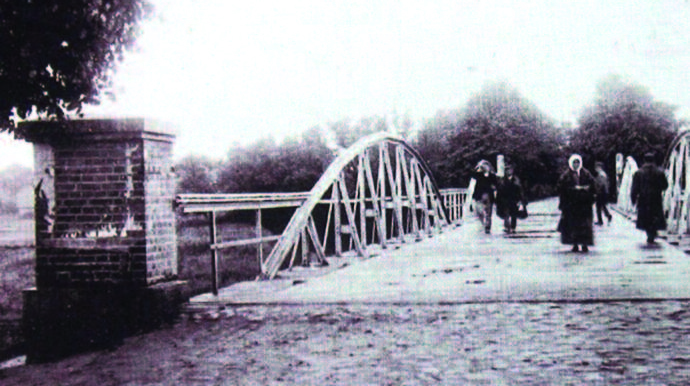 Bridge linking Naumiestis with the town of Širvinta (not rebuilt after WWII) across the border in Prussia. Vincas Kudirka was the first true columnist in Lithuanian journalism, and in 1909 his collected writings were published in six large volumes. He wrote poetry and translated dramas, but perhaps his most influential works were the many polemical articles he wrote for Varpas. They appeared in each issue and constituted the section known as Tėvynės Varpai (Bells of the Fatherland). His numerous writings were influenced by Adomas Mickevičius and other Polish romantic authors, known for their idealization of the combatant spirit of liberty in nations and peoples. Yet Kudirka was a practical positivist and sought to actually solve social problems. Fascinated by Lithuania’s heroic and glorious past, he sought to popularize its history and engender pride in the people in order to protest Russian subjugation. Kudirka pointed out the heroism of students, who refused to pray in Russian before classes, and farmers who resisted the Russian authority’s attempts to repress their Catholic faith, even upon pain of death. Kudirka was a pioneer in the genre of political satire. He wrote four satirical stories: Lietuvos tilto atsiminimai (Recollections of a Lithuanian Bridge), Viršininkai (The Chiefs), Vilkai (The Wolves), and Cenzūros klausimai (The Question of Censorship). These satires effectively targeted the Russian Empire along with the tsar and his underlings, comically exposing their corruption and ineptitude. His contributions in the field of music were also impressive. Vincas Kudirka felt that familiarity with folk music was important for the creation a complete national identity. He harmonized folk songs and printed the notes and words in Varpas, encouraging readers not only to learn the songs, but copy them and share them with others. He prepared and published a two-volume anthology of Lithuanian folk songs titled Kanklės (Lithuanian Zithers) in 1895 and 1899. This first-ever printed anthology served as an impetus for the beginnings of professional music publishing. As an amateur musician, he also wrote pieces for the violin (which he loved to play) and pianoforte. In 1898, Kudirka published the music and the lyrics for his eight-line poem Tautiška giesmė (Song of the Nation) which became adopted as the Lithuanian National Anthem in 1919. 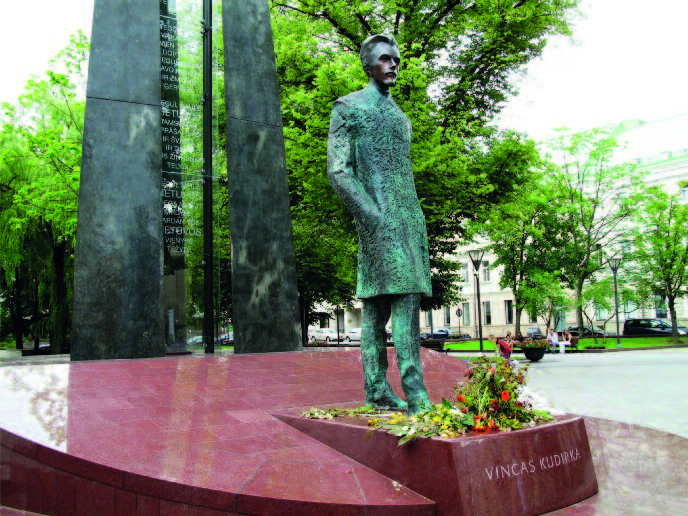 On July 5, 2009, an impressive statue of Vincas Kudirka was unveiled on Gediminas Avenue in Vilnius. It coincided with festivities marking the one thousandth anniversary (!) of the first mention of the name of Lithuania in written chronicles. The occasion was a fitting one to honor a great Lithuanian, who passionately promoted pride in Lithuania’s past in order to draw strength from it today. Kudirka’s patriotic ideals continue to inspire the daughters and sons of Lithuania, with a love for their country that burns in her people’s hearts forever.